The plight of the Thai soccer club trapped in a cave got me thinking about a memory from 1972 or ’73, when I was very nearly trapped in a cave under similar conditions. I have only limited recall of what actually happened, so I wrote what I remembered and shared it with the friends who were also present. The following is a group reminiscence that explores the unreliability of narrators as much as it does the events of one summer evening. That spring of 1972 we begin to call ourselves “the family.” In the nucleus were Marty, Donna, Colette, Victor, his brother Ric, and me. Around the edges floated some boys and girls. Don was one of the more regular floaters. His thing was outdoor adventures. He was the one who started us on spelunking. Don had the gear—helmets with carbide headlamps, ropes, maps, some knowledge of technique, although caving doesn’t really take any technique. It’s just hiking in the dark on irregular surfaces. 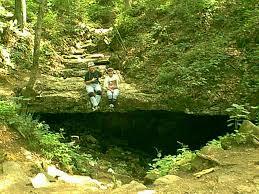 You go caving in Indiana in the dead of summer and the dead of winter, because it’s always 50-some degrees in a cave. It’s a great place to escape from unbearable weather. We’d often head south from Indianapolis in mid-afternoon for the hills around Bloomington, where there were many caves in the limestone karst bedrock. We’d eat a picnic supper before climbing in, or pack it with us. When we’d stop to rest, the boys would turn off their headlights and we girls would squeal. There would be giggling and sometimes smooching in the dark. We’d climb back out in the wee hours of the morning, clean up in the bathroom at the Waffle House and refuel, then head back to Indianapolis in time to go to work or school. We were in our late teens. We were invincible superheroes. We did just this, one summer afternoon in 1973. The family set out from Indianapolis—were we in Marty’s van or Don’s? No matter—and arrived at a cave around suppertime. A barn stood near the entrance, and a box with a sign-in book. When we arrived, a group of Eagle Scouts were cooking their dinner and settling in to camp overnight. We nodded coolly at them—we freaks didn’t associate with organization men like them—signed in and proceeded to the cave entrance. When you enter a cave, you go through a change in relationship to your body, and this is what I loved about spelunking. At first you’re still a biped, adjusting to being a sightless one, the bright beam of the carbide headlamp extinguishing all peripheral vision. But then, kinesthesia takes over. You become aware of every part of your body. You know exactly where the back of your head is. You crawl on all fours as easily as walking. It’s a dance with the infinitely changing surfaces around you. Your hearing adjusts to the silence that blooms into a chorus of echoes and dripping water. It is magical. That summer evening, unbeknownst to us down in the bowels of Monroe County, a summer thunderstorm passed through. Torrents of rain funneled in the same cave opening through which we had army-crawled down a narrow passage of some 600 feet. Someone noticed a change in the sound—the drip became a purr, then a burble. “We’d better head back,” Don said. “That’s rising water.” He led us back the way we came. (I never paid any attention to direction underground, trusting my tribe. Don had a technique of turning around to memorize the reverse view, each time we transitioned from a narrow space to a chamber.) We made it back to a wide ledge near the cave’s opening. Between us and the mouth, a little underground creek flowed through the narrow entry passage. It had been a mere trickle when we crawled in. It was now a few inches deep and flowing fast. “The rum!” Marty exclaimed. “I left the canteen back where we stopped to eat!” The boys looked at each other with concern. We girls looked at the boys. “I’ll go back for it,” Victor said, always the gentleman. “I’ll go with you,” Marty said. This is the point at which my memory diverges from those of my friends. Marty tells me we were planning to sleep in the cave that night, and we had left more than rum—our sleeping bags and other gear were back in one of the chambers. Victor and Marty crawled back into the dark behind us. The rest of us waited on the ledge. The little creek rose. And rose. It came close to the ledge on which we perched. The headspace above it, the air we would breathe as we crawled through the narrow passage, diminished. Where were those boys? We waited… and watched that headspace narrow. At first, Don and Ric tried to tease us with scary stories. Then they stopped. We hallooed the boys—no answer. We waited… and contemplated going forward without them. No. Yes? No. Had something happened to delay Marty and Vic’s return? What to do? Here’s where my memory goes dark. I recreate the following: At the last minute, they reappeared. We crawled through water with our noses up against the rocky roof. We climbed out into the humid summer night, feeling electricity in the air. A major summer storm had clearly unleashed its fury above that cave. Victor tells me that when he and Marty reached the chamber where our half of the party had been waiting, “Some kind of atmospheric inversion caused smoke to funnel into the cave. It was like Armageddon trying to get out of there.” Donna says “I wasn’t there.” That leaves me to infer that it was Colette, Don, Ric, and me who left our friends behind in the cave—I’d like to think it was because we realized we could be more useful in calling for help if we weren’t also trapped—and somehow managed to light a little fire. But Marty says, “Victor and I left when the creek started rising and swamped the fire,” so maybe we lit the fire inside the mouth of the cave? Or it was the Scouts’ fire, quenched by the downpour, that sent that smoke down the hole? Darkness shrouds the details. Here our unreliable memories converge again. We all walked up to the barn where the Eagle Scouts had taken shelter. Feeling like Odysseus returning to Penelope, we burst in, expecting—what? That they had noticed we might be in peril? One of the Scouts was in the middle of telling a long, circuitous, and very lewd joke. Gripped as they were by the storyteller, no one noticed us. We settled in and waited for the story to end, passing our canteen and quieting our shaken nerves. The guffaw at the story’s end was a lightning flash—horribly savage, brutally male. While I’d felt relatively safe all the time in the cave, now I felt bodily danger. We backed out of the barn, stripped off our muddy coveralls, climbed back into the van, and headed toward Indianapolis. We pretended we were fine. We weren’t fine. We had entered that cave young gods. Now we knew we were mortal. Great how you turned long-ago memories and group input to a cohesive story! Timely, and frightening insofar as to what can really go wrong in those youthful expedition. I had a similar though less harrowing late-teen experience in backcountry Hawaii, when a group of us hiked across a stream, only to return and find it swollen with sudden rains. Linked arms and made it back across, losing a camera but nothing more. You conveyed a lot in a short essay, and brought back memories! I hope you’ll write that up & share for a future blog post, Jeremiah!